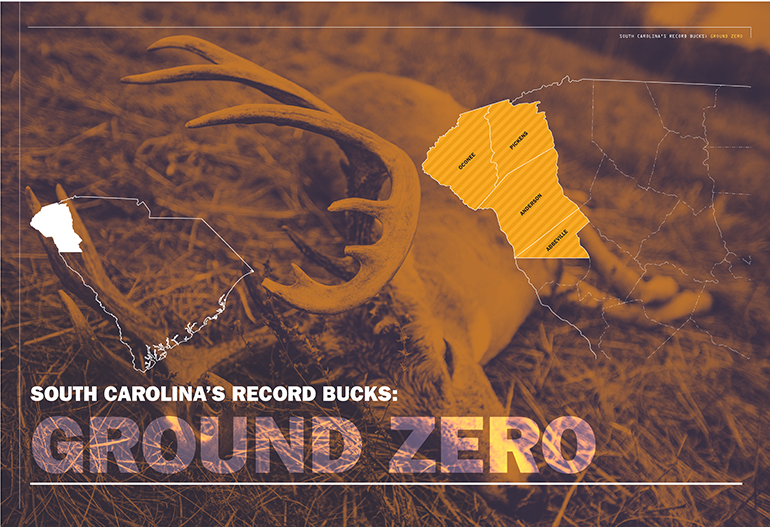 Put the odds of tagging a big buck in South Carolina by hunting this four-county area. One area of big-buck focus is the upstate areas of Anderson, Pickens, Oconee and the northern part of Abbeville counties. According to Charles Ruth, Big Game Coordinator for the SCDNR, specific reasons exist for the trend of big bucks from this geographical area. Much of the land in this area is private, and hunting clubs lease a large portion of the best land. Thus one of the most direct ways to access this habitat is for hunters to search for potential membership options into private clubs for hunting opportunities. Talk to other hunters currently belonging to clubs as possible sources for contacts to get into a club lease. Another option is to contact landowners whose property appears promising to see if you can lease or gain permission to hunt their land. This approach can be particularly successful when the landowner’s property is not extensive enough for large, multi-member lease but may have enough acreage to enable one or two people to hunt effectively. Charles Ruth says that properties with some habitat diversity – a mix of woods and open areas – are most likely to support quality bucks. “A good mix of habitats of tracts of timber with both hardwoods and pines interspersed along with open areas land being used for of agriculture purposes or even pastures seem to be a good blend of habitats for big bucks,’ Ruth said. Ruth says the situation in Abbeville County is a perfect illustration of this type of habitat. He notes that in the lower part of Abbeville County up to the town of Abbeville, much of the non-residential land is densely forested and a fairly small percentage is open land. Ruth says this type of habitat is found in abundance in Anderson County as well in many private land holdings in Oconee and Pickens counties. This varied habitat seems to be a big “difference maker” in allowing significant numbers of big deer to develop. Ruth says that the general characteristics of land that can produce big-racked and large-bodied deer are a combination of varied habitat, good soil and moderate deer numbers (which seem to favor growing larger deer as opposed to areas with high deer density where competition for resources tends to decrease the number of big deer). That’s the land you want to look for. It still takes considerable hunting and woodsmanship skills to identify and target specific places that may harbor big bucks. Hunters still have to have the skill to know how, when and where to hunt big bucks, and have the patience to employ those skills. But you can’t kill big bucks if there aren’t any on the property you hunt, and the more big bucks there are around you, the more likely you are to kill one. That’s why Ruth believes that the first order of business is to hunt in an area that has the right characteristics to grow big bucks. The 8,540-acre Fant’s Grove WMA is primarily owned by Clemson University and one other private landowner. Located principally in Anderson County, with smaller portions in Oconee and Pickens counties, Fant’s Grove WMA also sits on the shores of Lake Hartwell. Since 2000, Fant’s Grove WMA has been under quality deer management and is an archery-only hunting area. The details are specified in the SCDNR Rules and Regulations for this WMA. Charles Ruth said that despite the archery only hunting here, a big advantage is the Fant’s Grove WMA is that it lies right in the heart of the big buck country of Anderson County. In addition to the remote hunting accessed by land, some of the Fant’s Grove WMA is accessible by boat to islands on Lake Hartwell that are part of the WMA. Potential advantages exist from of being right on the lake and one example is the lake winds can bring slightly warmer temperatures off the water during the early season and protect blooms and buds. This can benefit deer in the form of more soft mast like muscadines and hard-mast crops such as acorns. Another benefit of the WMA’s association with the lake is that hunters can scout from the water, looking for deer as well as potentially good stands of hardwoods. Once a good stand is located, the acorn crop can be checked with binoculars and when a good acorn stand is found, it’s just a matter of finding scrapes, rubs, or trails leading into the area to determine where to set up. Also cuts washed into the landscape from drainages that lead to the lake make for good funnel areas. The deer often use those funnels to make their way down to the lake to get water or feed on new grass that springs up in the backs of coves, giving hunters more options for stand placement. The U.S. Army Corps of Engineers manages Lake Hartwell and they do have campgrounds available on the lake with excellent access to the Fant’s grove WMA. Call 1-888-893-0678 to get information form the Corps on camping and activities at Lake Hartwell. 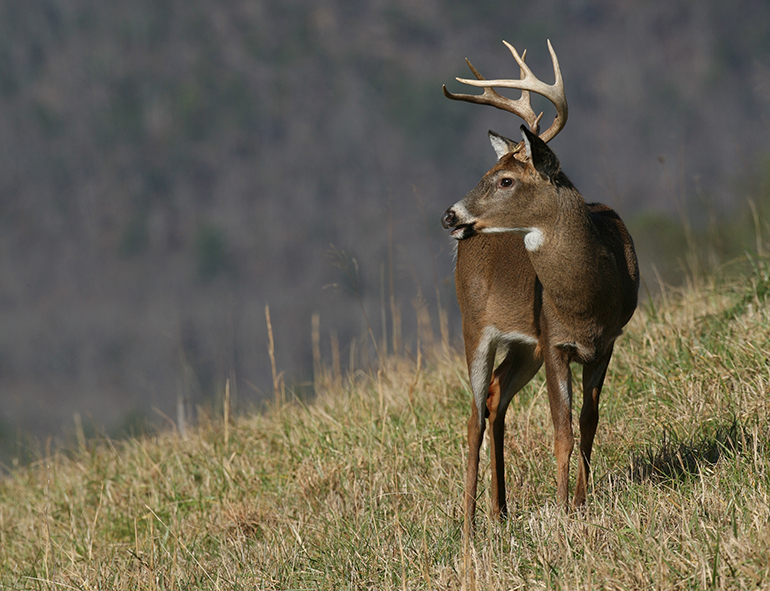 Charles Ruth said another good option for big deer is the rugged mountainous terrain of the Jocassee Gorges. “In this public area the potential exists to see and kill some really big bucks, but the population dynamics are vastly different here than in the other upstate areas we’ve been discussing,” Ruth said. “This is true mountain hunting and the Jocassee Gorges consists of very rugged terrain. Plus, the deer density in general is low. Don’t hunt here expecting to see lots of deer. However, it is an area where when you encounter a buck, it could be a real trophy. “Also, from my perspective, these woods are incredibly scenic and for hunters who enjoy the ‘big woods’ environment, this alone makes it worth the effort,” he said. Ruth said in addition to all the typical planning and hunting strategy development required to hunt deer, hunters need to ensure they have a realistic plan to get a deer out of the steep terrain. Access with motorized vehicles in not available in many areas and these remote places can often be the best places to potentially find a big buck. In addition to deer, the Jocassee Gorges represents most of the black bear habitat in the state and good populations of wild turkeys are also found on sections of the property. Almost all of the Jocassee Gorge properties are in the SCDNR WMA Program and are available for public hunting. Traditionally, this area has been a favorite destination for hunters who consider the rugged, picturesque terrain an advantage rather than a hindrance. Hunters are required to have a WMA permit, and hunters should consult the S.C. Department of Natural Resources “Rules & Regulations” publication for specifics. Generally, deer season is open from October 1 into January, but check the 2018/19 regulations for any changes. When hunting the Jocassee Gorges camping is a possibility. The state parks surrounding the Jocassee Gorges offer everything from pull-in RV sites for the weekend camper to rugged backcountry camping for the avid backpacker. Jones Gap, Oconee, Table Rock, Keowee-Toxaway, Devils Fork and Caesars Head state parks all offer camping at designated sites. For information about a specific park’s camp sites and reservations, call 1-888-88-PARKS or visit the South Carolina State Parks Web Site. Surrounding national forest lands provide a wide range of camping opportunities, from developed campgrounds to primitive camping opportunities. To find out what’s available, call the Andrew Pickens Ranger District at (864) 638-9568.